At this year’s Sundance Film Festival, the first film that really started a buzz was from the relatively under-promoted World Dramatic Competition, Gustav Möller’s “The Guilty,” now finally opening in limited release. It’s easy to see why so many critics and viewers have taken to this laser-focused study of a man whose prejudices and assumptions enhance a tense day on the job. With its single setting and real-time story, “The Guilty” is a brilliant genre exercise, a cinematic study in tension, sound design, and how to make a thrilling movie with a limited tool box. The film’s own restrictions actually amplify the tension, forcing us into the confined space of its protagonist. The opening moments of “The Guilty” might feel like mere wheel-spinning until the “real story” kicks in but they’re essential to why the film really works. In them, we meet Asger Holm (Jacob Cedergren) a Danish police officer embroiled in a bit of a controversy, and so stuck at an Emergency Services (their version of 911) call center until it blows over. We get snippets of conversation about a testimony tomorrow and learn that he no longer lives with his significant other, but we don’t know the details—these are just elements that add to the fabric of tension, and reveal that Asger is under a lot of stress. Asger is also kind of a jerk. In his role as the provider of necessary, often life-saving services, he can be judgmental and abrasive. A few calls early in the film reveal this character trait as he scolds one caller for taking drugs and allows another who has been mugged by a prostitute to stew in his bad decision before sending help. The idea that Asger isn’t as free from assumptions about the people who call him as he should be sets him up as a flawed character. And so when he gets a call that will change his life, we know that he’s already imperfect—and that could impact how the night unfolds. The call comes from a woman, who Asger identifies through his call system as Iben. She sounds like she’s in trouble but she’s not making a lot of sense. We soon learn, with Asger, that she can’t exactly say what’s wrong but she alludes to a very bad situation, and our protagonist soon gets sucked into the nightmare she’s experiencing. Well, he gets sucked into his interpretation of what she’s experiencing. “The Guilty” is a complex examination of how commonly we make assumptions about other people—how easily we can take a limited amount of information and fill in the gaps in a way that’s not always right. Just as he blames the drug taker for making a bad decision without knowing anything about what led up to that decision, he jumps to conclusions with Iben that prove to be his downfall. In a sense, all of us make variations on the mistakes that Asger makes in this film, only with less terrifying results (I hope). Think about how often we use a tweet or a text in ways to read the mind of the person sending it. One of the masterstrokes of “The Guilty” is how identifiable Asger feels. Even though he’s not exactly likable, we want him to pull out of the tailspin he’s in on this night, and “The Guilty” gains another level of complexity when Asger realizes that this night is allowing our hero to see how he got here—the aforementioned controversy—in a whole new light. 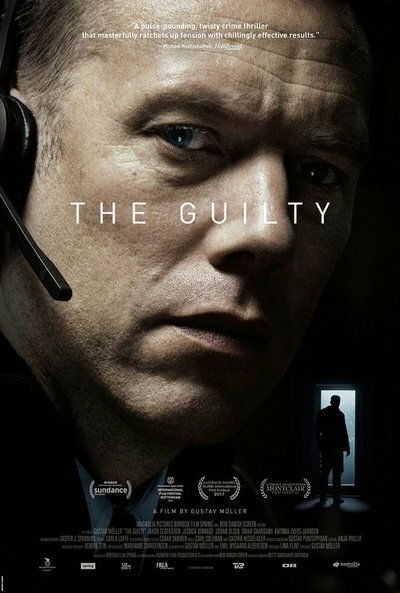 “The Guilty” is a tight, excellent piece of work that will likely be seen by way too few and forgotten in the year-end conversation. Denmark has submitted it for the Oscar for Best Foreign Language Film, a category that can often be hard to predict but typically goes with more recognizable auteurs or movies dense with internationally resonant social messages. It’s been a phenomenal year for this category with films like “Roma,” “Shoplifters,” and “Burning” almost certain to pop up. Those Cannes and TIFF hits deserve their acclaim, but don’t forget about the film from Sundance.